During the pre-production of ‘Leatherface’, a horror film script by Tobe Hooper and Kim Henkel, the production manager, Ron Bozman, was away in Houston playing poker, and he pitched the idea around the table. 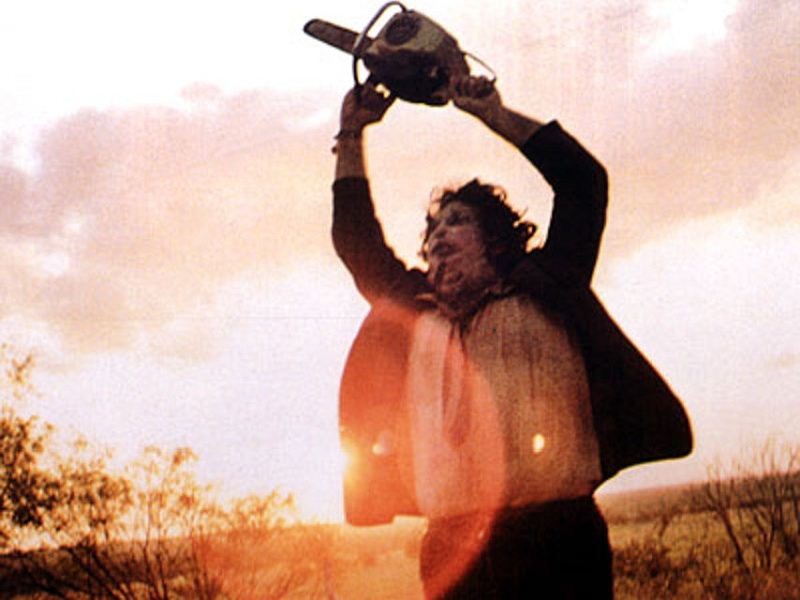 One of the players suggested an alternative name – The Texas Chain Saw Massacre (TCM). A classic was born. 2014 sees the 40th anniversary of its release. The title alone is a work of art, but it’s the way the film transcended traditional notions of the genre and threw us headlong into a terrifying nihilistic attack on the American dream that secured its longevity. The story is simple. Five hippie kids (Sally Hardesty, Franklin Hardesty, Kirk, Pam and Jerry) visiting their grandfather’s long forgotten, dilapidated house in rural Texas are terrorised by a grave-robbing family of cannibals (Old Man, Hitchhiker, Leatherface and Grandpa). The 40th anniversary restoration of The Texas Chain Saw Massacre is released in the UK on Blu-ray by Second Sight on 17 November 2014. The two-disc limited edition Steelbook Blu-ray is packed with new bonus features, including a new audio commentary by Tobe Hooper. Watching the ‘making of’ documentary The Shocking Truth I was amazed by the accidental way in which the armadillo spinning in the road in the opening moments ended up in TCM. The script version doesn’t mention it. Instead, it has the rotting carcass of a dog baking in the hot sun before the camper van zooms by. There is also no mention of the grave-robbing or the freeze-frame flash of the camera showing us the gruesome sculptures Hitchhiker left behind. Intrigued, I decided to explore some of the key moments of the screenplay to see how what Hooper and Henkel (H&H) wrote on the page shaped the film. H&H’s first draft of ‘Leatherface’ was a whopping 160 pages. This was reduced to 103 by the time it went into production. Roughly speaking one page of script equals one minute of screen time. TCM is a short film, clocking in at only 83 minutes. The main reason for this is that only half of the first 40 pages actually ended up on the screen: much pointless, hippy dippy dialogue about the zodiac and unnecessary exposition were thankfully dropped. When academic Carol J. Glover dared to watch TCM in 1985 she wrote in the introduction of her book Men, Women and Chainsaws: ‘It jolted me into questioning for the first time the notion of the “male gaze” and its assumption of masculine.’ This is best illustrated by the way our hero, Sally Hardesty, is introduced in the script. First she is an archetype – ‘a beautiful blond girl’. Just another one of the five stereotypical young Americans in a camper van driving through Texas. Even wheelchair-bound Franklin is simply described as: ‘a young man in a wheelchair’. The only hint of his weight is the ‘sagging ramp to the ground’ when he exits the camper van for a pee. Sally is braless and her breasts bounce enticingly beneath the thin fabric of her t-shirt. This exact image plays out on screen. With this shot, Hooper is able to make the camera, and therefore the audience, become the wandering eyes of the lusting rednecks in the graveyard. Out on the highway we are introduced to Hitchhiker. This Charles Manson caricature is clearly a product of casting, because on the page H&H described him with curly carrot-coloured hair. His role in the screenplay is to point out the post-industrial wastelands that the city (represented by Sally and her friends) had left him and his family through the economic destruction of this rural community. This exploration of the socio-political climate for horrific ends continues what The Night of the Living Dead (1968) and The Last House on the Left (1972) had started. For decades the horror genre explored evil fantasy monsters or ghosts in far off places like Eastern Europe. But with America stuck in a war it couldn’t win, the liberal dream stabbed to death at Altamont and serial killers now becoming pop celebrities. George A. Romero and Wes Craven’s films invited audiences to look at the dark reality of their country. For Hooper, appalled by the atrocities of the Vietnam War, ‘man was the real monster’. Kirk catches a fleeting glimpse of a horrible leathery mask covering the face. As her eyes adjust she sees that the furniture is constructed of a combination of bone, metal, wood and some sort of thin leathery substance. Each piece of the macabre decor magnifies Pam’s fear and trepidation. It’s uncomfortable because you’re watching and waiting to see someone die. On the page it’s a much slower, more gruelling experience as you pick your way through each piece of human bric-a-brac. There’s far more here than the camera has time to look at, but you get the sense they’re in the room nevertheless. When the killer finally reappears H&H reveal precisely what Leatherface looks like using Pam’s POV. It is a close fitting hood rather than a mask, covering the entire head and slit to accommodate the ears. The face of the hood is human, but shrivelled and leathery. There is a throat piece which is tucked below the collar. Over his clothing the masked figure wears a black heavy apron. Later, on the same page, they condense the description to christen him Leatherface at the very moment when he stuns Pam with a hammer. The formula is speeded up for Jerry’s more efficient death. The surprise of the first murder and the subsequent suspense in the run-up to the next two elevate the drama in the TCM screenplay above the purely exploitative graphic violence of Last House on the Left. This is because Hooper’s direction never lingers on the violent act. Like Craven he shocks you, but he’s never interested in the blood spilled by Leatherface. Although the screenplay revels in the blood lust of our killer, none of it made it on screen. …but her throat fills with blood and she chokes and gags. Leatherface moves swiftly. He strips Kirk’s body of its remaining flesh, lifts it from the meat hook and lays it on a huge butchers block. Blood pours from Pam’s mouth. Her hands flutter weakly; her eyes have rolled back in her head and show only white. Leatherface draws the starter rope of a gasoline powered chain saw and it coughs then roars. Pam twitches faintly. She coughs and spews a bloody mist clouding the air. The chain saw changes pitch as it bites into Kirk’s flesh. No doubt budget and time would have had an impact on Hooper’s directorial decisions. Certainly the introduction of the chainsaw is held back a little bit longer. Franklin guesses her intentions and is reluctant and deliberately stupid. Here’s where Franklin begins to honk the horn and they discover the van keys are missing. They no longer have the choice of heading back to the gas station for help. Sally has to go looking for their missing friends. But her brother, ever the burden, goes after her and for the first time his disability actively becomes a problem for both of them. Sally moves rapidly away; she does not respond to Franklin. Franklin is close behind, labouring desperately to keep up. His chair wobbles awkwardly and he has difficulty in steering. Sally…. I can’t keep up. Still Sally does not respond and Franklin begins to drop behind. She enters the forest; Franklin is desperate. [Sally and Franklin] whirl to face the noise and see a massive, hulking figure roar down upon them wielding a chain saw. The ugly steel fangs of the saw flash in the moonlight and the waving beam of the flashlight. It’s the first time Leatherface is paired with his signature weapon. In the script this is page 73 out of 103. Admittedly, it’s only around 50 minutes in on screen. Franklin is dispatched in seconds and Sally runs away screaming. By killing Franklin, H&H invented ‘the final girl’ phenomenon. Sally escapes to the Old Man’s service station via the house and through a forest. In the screenplay there is some traffic on the road that swerves around Sally as she ‘screams and pleads’ for them to stop. None of this made it into the film. I would argue that the presence of others at this stage would have severely weakened the end sequence. Safe inside, and the threat of Leatherface seemingly gone, she soon discovers that her saviour is also part of the murderous clan. The Old Man is carrying a gunny sack; his behaviour is strangely ominous. Sally senses something is amiss and looks more closely at him. In the script the graveyard crimes from the opening segment of the film are used by the Old Man to chastise the Hitchhiker as they bring Sally into the house. I told you to stay away from that graveyard. I told you. I told you never leave your brother alone. So what would appear to be big, important changes at the start of the film barely get another mention by the end of the film. Decanted to the house she meets Grandpa, and in a satire of the nuclear family, Leatherface plays the role of matriarch. The mask is distinctly different from the one he wore earlier. It is the tanned facial skin of an elderly woman. Behind the mask Leatherface is smiling broadly; there is a flash of filed teeth. He is excited and pleased with himself; he approaches wiping his hands on his apron. Rather than make him a fully fledged member of the family, each time he speaks, it gives the Old Man more reason to shout at him. It is during these exchanges that the film, more than the screenplay, expose this sadistic, mindless killer as no more than a simple child behind closed door. James Rose’s book about TCM (Devil’s Advocates series, Auteur Press) describes this scene as a warning about how far people are prepared to go if you cut them off socially and economically. On the page we can read a list of horrors that Sally can see in the room. Whereas on screen Hooper chooses to show the horror etched into Sally’s face as she, bound to a chair and gagged, takes in the room. He saves the revelation of the bone ornaments and mobiles for a wider shot when the family bring Grandpa into the room. Hitchhiker turns her palm up and quickly and expertly cuts deep into the tip of her index finger. Leatherface lifts her hand and with Hitchhiker’s assistance they force it into the Grandfather’s mouth. Her will to survive is tested over 14 pages of script (pages 86-100 or 64-78 minutes). The moment she sees her opportunity she runs for it. However, H&H don’t let her get out without an obstacle or two. Blood pouring down her face, they write, she trips over the washtub and crashes through a window in a shower of glass. When she reaches the highway the real world makes a surprise appearance in the shape of a cattle truck and a pick-up. Sally escapes in the back of the latter. It’s a swift, and surprisingly neat end to such a lengthy, torturous ordeal. In just two minutes of screen time Sally leaps through a window, outruns the family, Leatherface is fatally wounded by his chain saw, and she is in the back of a pick up being driven away from this nightmare experience. This compares to over four pages of screenplay. Stylistically, the script deviates from how it has been presented so far. H&H begin directing the camera. This simulates how frantic the situation has become. Like a cap that has been let off, the film and all the tension are being released. The Driver leaves the road and runs into a field. Leatherface recovers the saw, sees Sally and the Driver running in nearly the opposite directions and squeals in terror, rage and pain and flailing the saw wildly in the air and now hobbling and bleeding profusely, he charges after Sally. It has become traditional to linger on the victim’s success as the credits roll, but H&H’s finale is about the monster that’s left behind. That iconic silhouette is no accident. Leatherface stands in the center of the highway squealing in maniac rage and wielding the chain saw with savage, idiot fury. In conclusion H&H’s story is a simple one – five young people leave the city and become isolated from the real world as they knew it; and then from themselves. One by one they are killed until there is only one left. It was a novel idea at the time, but now it is a tired formula used by almost every slasher film. Regardless, this 1974 original still rises above all its competition because of its clarity. On the page H&H lavish the reader with lots of extra scenes and gory details of the kills that are unmistakeable horror tropes. However, Tobe Hooper decided much of it held the story up and just weren’t necessary. More importantly, he decided to leave the bloodshed to our imagination and that choice gave the film its power. As a result the perceived feeling of many viewers, after watching TCM, is that it is a much more graphic film experience than it really is. Proving suggestion rather than details is what our eyes and ears need when we’re watching a movie. Hooper no doubt had this all in hand when he started shooting TCM, and the screenplay acted as both a road map and footnotes for his vision. This feature is part of our LFF 2014 coverage.